While the Pentagon frets over its chances against China or Russia, Vzglyad’s Mikhail Bolshakov writes about why the Russian air forces would lose a battle with the United States. Russia’s purported fifth-generation Su-57 fighter — yet to enter series production — might (as the VKS and OKB Sukhoy insist) be superior to American F-22 and F-35 fighters, but Bolshakov says the U.S. would still win. Sukhoy chief designer Mikhail Strelets claims the Su-57 combines and surpasses the capabilities of the F-22 and F-35 in one fighter. The choice of the index 57 — sum of 22 and 35, he says, was a coincidence but still indicative. However, Bolshakov points out, the U.S. has 187 F-22 and 320 F-35 aircraft in its operational inventory at present. Russia has no Su-57 fighters in line units. The F-22 is 28 years old, and the F-35 at 18 is still suffering growing pains. And Russia, Bolshakov concludes, has clearly not lost its ability to design and produce modern combat aircraft. It built a competitive fighter in a short period of time. Lacking U.S. levels of funding and with few rubles for weapons development, Russia adopted a “small step” approach. First and foremost, Sukhoy modernized existing fourth-generation fighter designs, developing “transitional” so-called generation 4++ aircraft on the base of the successful Soviet Su-27. This led to multirole Su-30 and Su-35 fighters and the Su-34 fighter-bomber. Rival MiG was not as successful updating its MiG-29 and that’s why the MiG-35 light fighter still hasn’t been produced. Since 1991, Sukhoy has produced 118 Su-34, 630 Su-30, and 84 Su-35 aircraft. The problem is most of them were for export and didn’t go to Russia’s air forces. According to Bolshakov, Russia has 108 Su-34, 194 Su-30, and 70 Su-35. It’s not well-known how many of these aircraft are combat ready. So, even accounting for Moscow’s fourth-generation fighters, Russia’s air forces are significantly inferior in numbers to those of the U.S., and especially of NATO, he concludes. Compounding the problem of low numbers is a tendency to spread new aircraft over the entire force, creating headaches in pilot training, parts supply, and maintenance and repair. Regiments have to plan for retraining pilots when they don’t know when they will actually get new planes. Meanwhile, they have to be ready for combat missions in the old ones. To top things off, most Russian air regiments since the mid-1990s have operated with two squadrons, not three as in Soviet times. Bolshakov sums up saying the real equation is 187 + 320 = 0, and Russia’s task is to turn that zero into 50, 100, or 200 through consistent, well-planned efforts. The country needs to reequip its fighter aviation without “small steps,” “robbing Peter to pay Paul,” or “temporary solutions” that somehow become permanent. The Russian MOD certainly doesn’t like to hear the state of affairs aired this way. But a journalistic smack-in-the-face is more realistic and useful than an entire collection of propagandistic Mil.ru, RIAN, or TASS reports on systems entering the forces today. Maybe the issue is political. The Kremlin doesn’t want the press saying that rearmament may not be going so smoothly. Bolshakov wasn’t focused on the U.S., so leavening is required if we want some “net assessment” of air power. The quickest glance at the Western press shows the USAF has its hands full with keeping 50 percent of its F-22s flying at a moment’s notice. The F-35, more computer than plane, presents its own maintenance and readiness challenges. Aircraft inventory is important, yes. But so are operational readiness, flying time, tactical training, and especially employment scenarios. The USAF is inherently expeditionary. It will fight in someone else’s backyard. Every battle will be an away game. Russia’s air forces will usually be right next door to any conflict involving them. And Russia’s tradition is more air defense and homeland protection. ODK General Director Aleksandr Artyukhov has dampened the prospects for Russia’s developmental fifth generation fighter aircraft, the T-50 or PAK FA. Friday in Lukhovitsy at the presentation of the MiG-35, Artyukhov told RIA Novosti that R&D on PAK FA’s “second phase” engine won’t be complete until 2020. This contrasts with the more hopeful announcement late last year from Sukhoy aircraft plant KnAAZ when the “second phase” engine or “item 30” commenced stand tests. ODK’s Artyukhov told the media that the plan is to begin flight tests of the “second phase” engine this year. Existing prototypes fly with the first phase or “item 117S” engine (AL-41F1S). However, “item 30” advertises reduced infrared signature, increased thrust, supercruise, improved fuel efficiency, and lower life-cycle costs. Artyukhov’s predecessor said more than two years ago that a PAK FA with a “second phase” engine would not fly until 2017. ODK once hoped this would happen in 2015, but OAK’s former chief Mikhail Pogosyan said possibly not even before 2019. But even with a tested “item 30” engine, it will be a challenge to integrate and test it fully this year. So the first PAK FA fighters to reach the Russian Aerospace Forces (VKS) will probably have “item 117S” engines. As the PAK FA’s engine has slipped, so has the aircraft itself. The VKS officially hopes to accept its newest fighter in 2017, and take delivery of five in late 2017 or 2018. It looks toward a total buy of 55 PAK FA. However, in mid-2015, Deputy Defense Minister Yuriy Borisov said the military would procure one squadron of 12 PAK FA. He didn’t commit to more. Borisov said Russia would buy fewer PAK FA than planned because the 4++ generation Su-35 is superior to new foreign fighters in many respects. RBK-TV ran a short segment on 3 October indicating that OAK, Sukhoy, and KnAAZ (aka KnAAPO) will deliver (or will have delivered) 22 Su-35 aircraft to the Air Forces by the end of 2014. Twelve Su-35 were reportedly delivered in 2013, so 22 plus delivery of 14 more in 2015 would fulfill Sukhoy’s 2009 contract for 48. There’s been talk all along about a follow-on contract. The report briefly covered the aircraft’s capabilities and noted that China would be the primary foreign customer for it. However, according to RBK, the export variant will not carry the same avionics as the domestic version. The video features OAK President Mikhail Pogosyan saying that the corporation’s military production is fully independent of foreign suppliers (and therefore unaffected by Western sanctions). The broadcast ends noting that more than 12 billion rubles have been invested in Sukhoy’s modernization over five years. More than 3 billion from targeted state programs have gone into financing Su-35 development. Some Russian defense news from August 6, 2012 (and a bit earlier too) . . .
Militaryparitet.com picked up the VVS CINC in Interfax.ru talking about the Su-35 flight test program, and serial production beginning in 2014, or even next year. PAK FA, he said, will be produced from, or after the start of, 2015. Mil.ru and KZ published on the beginning of Rubezh-2012 — the ODKB’s Collective Rapid Deployment Force exercise at Chebarkul. Vladimir Mukhin, however, writes in today’s NG about “fault lines” in collective defense. 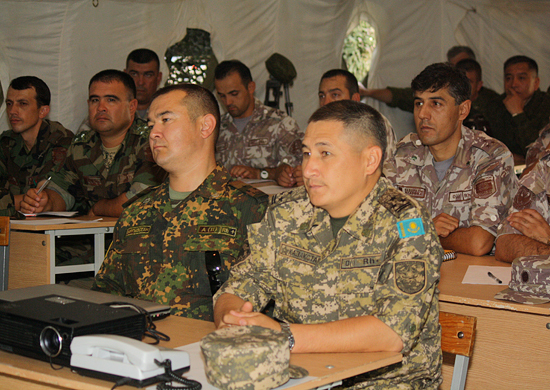 He contrasts the alliance’s exercise activity with its inaction against real Central Asian instability. Coastal rocket and artillery units have been busy. Mil.ru showed the DP-62 Damba MLRS firing from the beach on Kamchatka, and TsAMTO covered a Western MD press-release about Northern Fleet launches of Rubezh and Redut coastal antiship missiles. KZ today issued its take on the Navy CINC’s comments during Ekho Moskvy’s Voyennyy sovet program last week. It’s always interesting to compare the KZ summary with Ekho’s transcript. Mil.ru reports the well-nigh forgotten future professional sergeants in training at Ryazan will graduate in November. It says 130 will head off for new assignments. Recall this grew out of the failed 2003-2007 contract service program, and utilized space available due to the drastic reduction in officer training. Izvestiya provided a late 2010 look into how few men showed up and lasted at Ryazan. In early 2011, the Defense Ministry slashed the funding and largely euthanized the stillborn effort. One waits to see how it’ll find 425,000 contractees in the future. Some Russian defense news from April 17-18, 2012 . . .
Militaryparitet.com provided a link to an interesting Livejournal site. The latter’s apparently been scouring government tender offers, and located one worth 600 million rubles for work to upgrade Votkinsk for Yars ICBM production. According to RIA Novosti, a Rosoboroneksport official says talks with China about selling the Su-35 are frozen because the PRC wants to buy only a limited number of the new fighters. Interesting that France, Italy, etc. don’t use the same logic when Moscow talks about purchasing samples. Vzglyad.ru covered the release of SIPRI’s global military expenditure report for 2011. The U.S. spent 41 percent of the world’s total, China 8, Russia 4. Deputy Defense Minister Nikolay Pankov talked to the Federation Council about military housing. He told Senators 60,000 permanent and service apartments were ready to be occupied at the beginning of this year. See TV Zvezda coverage. At least for the camera, Pankov didn’t offer an explanation why such a large number were waiting to be occupied. 22nd Army Commander, General-Major Sergey Yudin’s traded his command for a staff job. He’s now the Chief, OMU for the Western MD. See Mil.ru. Air Forces CINC, General-Colonel Aleksandr Zelin gave NVO editor-in-chief Viktor Litovkin an extremely long interview last Friday. Zelin expanded on things he’s said in previous press encounters. Some interesting stuff. Here’s the first part of a quick synopsis. Su-34. Zelin mentions the contract for 92 by 2020, but says the VVS will buy 124 or even 140. He again talks about making it a strategic platform by adding a long-range cruise missile. Su-35. The contract for 48 could become 100. Su-30SM. This fighter will be used in the progression of pilot training for Su-35 and PAK FA / T-50. Yak-130. Zelin mentions using this trainer as the base to develop a light strike fighter for training Su-34 and Su-35 pilots. MiG-31. The Air Forces CINC expounds on this old interceptor and plans for it. About 100 will be kept, and Zelin talks about using a meter wavelength navigation system on it (and other aircraft) so it can operate from civilian airfields. Su-24. Two squadrons of “high series” Su-24 will be kept under Gusar and Metronom R&D efforts. This is necessary because the VVS can’t go entirely to the Su-34, which, incidentally, will be based at Khurba, Chelyabinsk, Krymsk, Voronezh, and Lipetsk. PAK FA / T-50. Still planning on 60. Air Forces CINC, General-Colonel Aleksandr Zelin made a variety of remarks to the media this morning. It’s not clear where yet, but it might have been a press-conference at ITAR-TASS. It’s the season for such things with Air Forces Day and MAKS-2011 just ahead. Army aviation will expand by more than 1,000 helicopters by 2020. The number of army aviation bases will grow from 8 to 14 during that time. He mentioned reestablishing production of Mi-26 transports in a POL supply variant. Zelin doesn’t sound like he’s willing to surrender the VVS’ hold on army aviation. Zelin mentioned getting 8 or 6 new Su-34 this year. ITAR-TASS gave both numbers, but we’ve seen six elsewhere. The VVS CINC criticized work on the Su-35, saying it has a number of problems. PAK FA / T-50 is going on schedule, but he wouldn’t say when he expects it to enter the inventory. On UAVs, some drones will go to the Ground Troops per a Genshtab decision, but Zelin says operational-tactical unmanned aircraft will stay at air bases under the control of military district commanders. Without mentioning S-500 development, Zelin talked about new Morfey and Vityaz SAMs. Morfey is a short-range system mentioned before as part of S-500. Zelin described Vityaz in greater detail, calling it an improvement on the S-300 with greater capabilities and 16 missiles per launcher. See ITAR-TASS for this. Zelin said there will be four S-400 regiments by the end of 2011. He said the second one, the 210th Air Defense Regiment, went on combat duty with it last week, so two more are expected. The CINC said the manufacturer’s had problems with the system’s long-range missile, but there is an understanding on how to resolve them. The Air Forces, he says, still want Almaz-Antey to build another production plant. Interfaks posted on this. The next 6 Pantsir-S gun-missile air defense systems will go to the OSK VKO around Moscow. Zelin said the first 4 went to the 4th Air Forces and Air Defense Command at Novorossiysk. Another flight demonstration group will be formed using Yak-130 trainers. Zelin expects to get a new A-100 AWACS aircraft, based on the Il-476, by 2016. He says it will have both air and ground surveillance missions. The plan has Genshtab and financial support, according to Zelin.